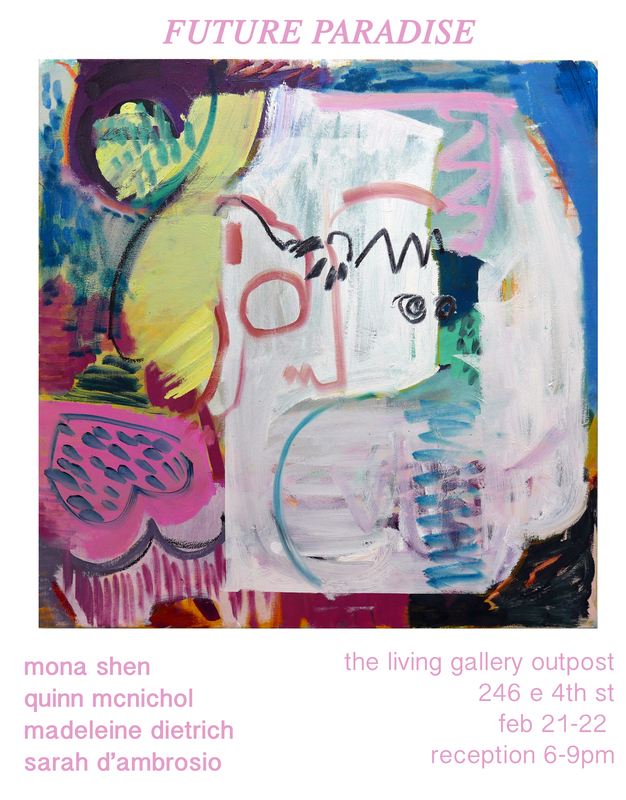 “Future Paradise,” group exhibition of new works featuring Quinn McNichol, along with Mona Shen, Madeleine Dietrich, and Sarah D’Ambrosio, will run February 21, 2019 – February 22, 2019, with a reception both evenings from 6-9 p.m.
Quinn McNichol’s vibrant cut paper pieces have a transformative quality, shifting daily routines and conversations into humming, otherworldly scenes. Expressing emotions kinetically through color expands the artist’s understanding of intimate relationships, as well as the world around her. The show features the four women artists whose work seeks an imagined escape to alternate realities. In their figurative and environmental abstractions, each artist delves deep, using their creative practices to process to expand on their personal narratives, exploring themes of intimacy, sexuality and the current state of our country, often working from their own experiences with friends and romantic partners. Through these warm, dreamy works each artist finds solace in her concept of a Future Paradise. Sarah D’Ambrosio derives emotional responses through direct figuration in her work. Her sensual paintings examine the female gaze, picturing reclining male bodies, skewing the audience’s viewpoint on what constitutes a sexualized body. 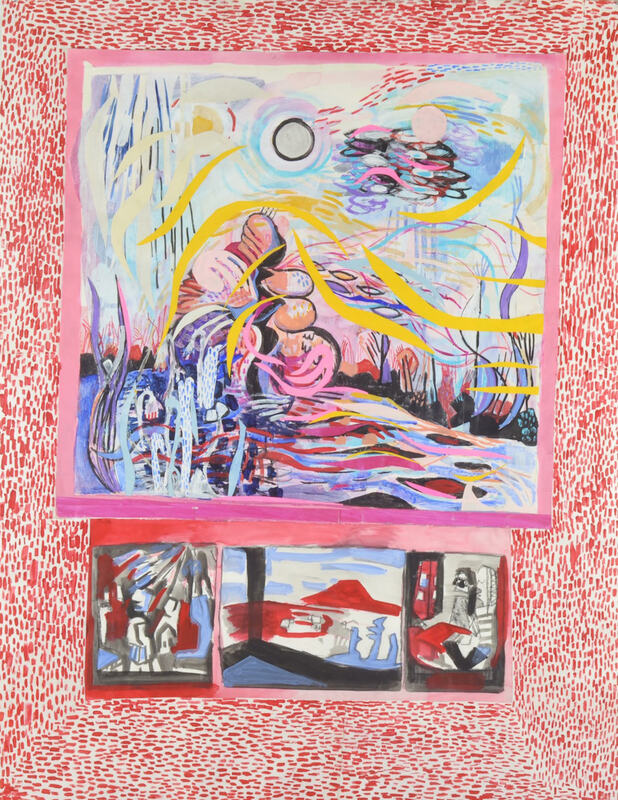 Madeleine Dietrich’s mixed media abstractions serve as the artist’s visual diary: an aid in processing her experiences of sexual assault and gender queries as a queer woman. Her intimate mixed-media portraits explore the unique expression of each subject’s persona and sexuality. Mona Shen’s large-scale, atmospheric paintings focus on a shifting environment, creating dream-like, abstracted spaces; her scenes allow for a fanciful journey beyond the obstacles of city living. Quinn McNichol studied at Pennsylvania College of Art & Design, and is still occasionally back at PCA&D, assisting with the gallery or other programs. 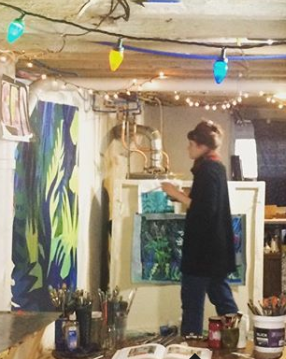 Quinn has continued her studies at various residencies and art programs. Mona Shen grew up in Southeast China and is a recent graduate from the New York Studio School’s MFA painting program. A Brooklyn native, D’Ambrosio earned her MFA from the University of New Hampshire and recently moved to Philadelphia, PA. Dietrich and McNichol both grew up in Philadelphia and currently live there; Dietrich studied at the Fashion Institute of Technology and has traveled across the US and Europe to find inspiration. McNichol, Shen and D’Ambrosio are all alumni of the Mount Gretna School of Art. Friday’s reception features a live set by Jewelssea, a Philadelphia artist making transcendent vaporwave beats. Her subtle, evocative sound has roots grounded in hiphop, with notes of shimmering, nostalgic synth pop. “Future Paradise” is a pop-up exhibition running Feb 21-22 in the heart of the East Village at 246 E 4th St, in the historic 53 Avenue B building. The artists will be present at the reception both evenings, Feb 21 and 22 from 6:00 – 9:00 p.m. Gallery hours are Thursday 1:00 - 6:00 p.m. and Friday 12:00 - 6:00 p.m.